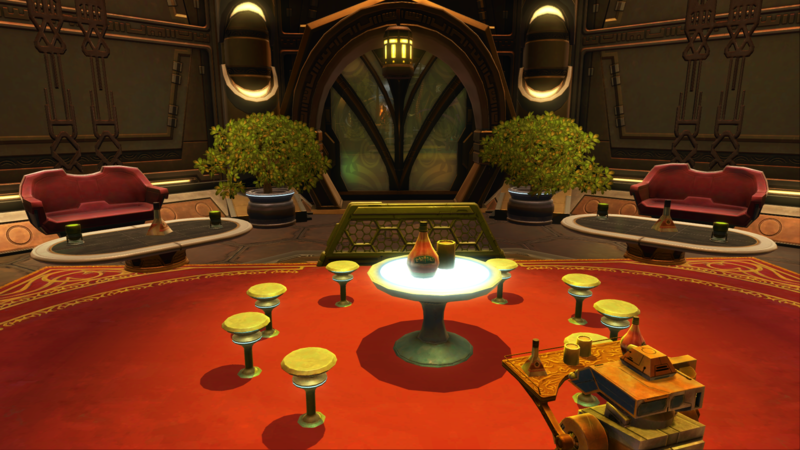 I wanted to make a thread for one off stronghold decorating ideas that we come up with. These are not necessarily meant to hang around beyond getting the idea out of our heads, but we can share them here before we change to something else. Sadly, I am missing finishing pieces, but oh well. I'll start us off. Outside Realm / NaNoWriMo 2018! Ok, cutting it a bit close this year. However, just wanted to remind everyone that Nanowrimo is around the corner. You don't have to write 50,000 words or even everyday, but do write. This year I will be focusing on my Themaya project. Although I have been silent on it, I haven't dropped it. I've been busy writing, scrapping ideas, starting over, and reading lots and lots of guides. I might just skip the companion interaction missions for the sake of progress and work mainly on the class missions. Regardless, whatever your project, try your hand at picking it up and writing again. Remember, if nothing else, there's lots people in your position and we're all trying to get our words out too, but don't worry, we can do this. It's that time again everybody. Part Two! The party will start on the balcony, the food court, to keep people from being too spread out and will move down to the party venue at the bottom should enough people accumulate. Dress up, show out, and have a good time. This is a casual, cross-faction, RP, social event. 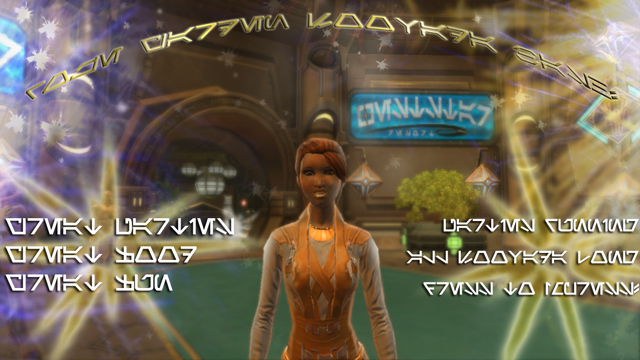 Open to all RPers so invite people from other communities if you can find them. If you want to come Impside, Effet has the ability to invite. Pubside, Jessak can invite. Keys are available to anyone that would like one for future RPs. It's that time again everybody! 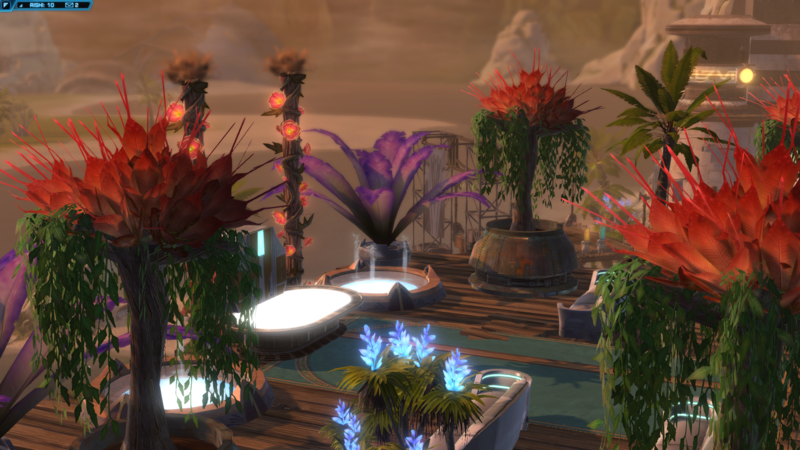 Soovada, the Festival of Splendor has come again to Nar Shaddaa and the Roze Garden is opening it's doors for celebration. The party will start on the balcony, the food court, to keep people from being too spread out and will move down to the party venue at the bottom later on in the evening. Dress up, show out, and have a good time. This is a casual, cross-faction, RP, social event. If you missed Jessak's pool party, show up this time. If you want to come Impside, let me know ahead of time, so I have some idea of how many to expect. Jessak is Pubside for the character and Jess'ak is Impside. [OOC] It's that time again everybody! 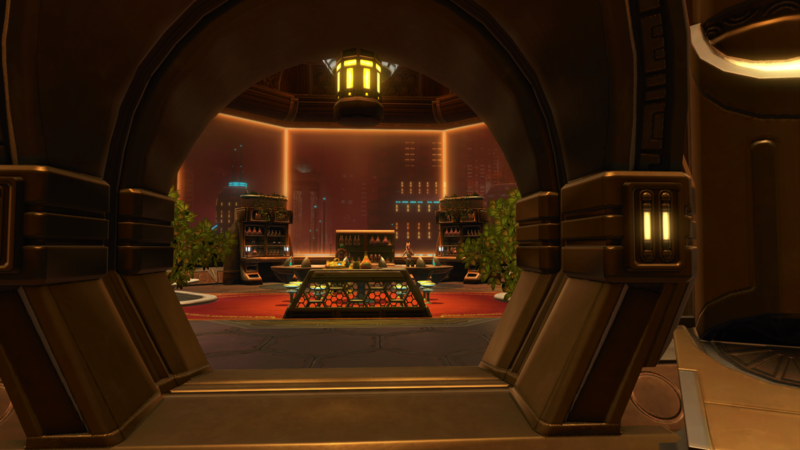 Soovada, the Festival of Splendor has come again to Nar Shaddaa and the Roze Garden is opening it's doors for celebration. If you want to come Impside, let me know ahead of time, so I have some idea of how many to expect Impside. Jessak is Pubside for the character and Jess'ak is Impside. [IC] The next commercial on your holofeed starts with a bang, or rather several. The smiling, young woman on the holo is framed by fireworks. Translation: Roze Garden Soovada Bash! Great Fun dress to impress! 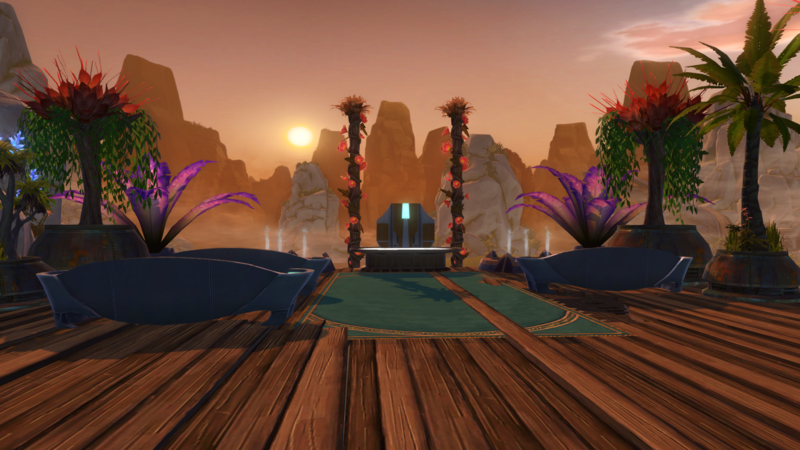 Come celebrate the wealth and splendor of Nar Shadda at the Roze Garden. Show off your power, influence, and most importantly your wealth. Increase your prestige and meet other successful people. Our doors are open all Soovada long. Only travel in the highest circles? The VIP area is available to special guests. Make an entrance in our spacious party venue. 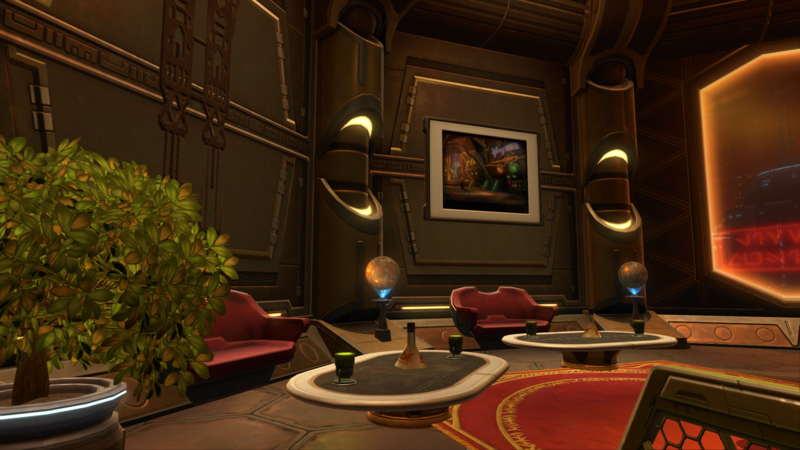 Sit and people watch elegantly as you sip your Hot Credits or show off your moves for the the whole dance floor. Three Times Stunning will be performing live all Soovada long including their recent hit, Master Of The Moon. so dance til you can't dance anymore. If you need to cool off after all that dancing or you've worked up a rancor sized appetite. Head to the food court to relax in the pool while grabbing a bite. Please eat responsibly. Some species should not enter the pool directly after eating. At the Roze Garden, we want all of our patrons to be able to enjoy their Soovada safely. For that reason, security has been increased. All visitors will be asked to check dangerous and potentially dangerous devices at the door. Monkey-Lizards and other equally as inquisitive pets are not allowed. Thieves will be handed over to the Hutts provided they survive initial attempts to wipe them from the face of the moon. Come make the Roze Garden your Soovada destination! Regular tea rooms will still be available for reservation during the festivities. Kam walked casually past drinkers, dancers, and other patrons of various species out to enjoy their evening. The lively music playing in the background provided a compelling soundtrack to his strut through the cantina. As one of the few human in the place, he stood out like a Jedi in a gang war. If it bothered him, he didn’t show it. Confident smirks greeted anyone whose eye he caught. He was self sure almost to the point of arrogance. Nonetheless, Each reaction was tailored. He worked to conceal his true reason for being there. Face after face, he scanned for his target. In the corner… She was sitting at an out of the way counter away from others trying to go unnoticed. Having finally found what he was looking for, he walked purposefully in her direction. “Hands up or I’ll shoot,” he laughed and made finger blasters in her direction. Joking aside, he maintained a maneuverable distance should the gesture be taken poorly. The Arcona woman in front of him neither laughed nor turned to look at the man lurking just over her shoulder. “You shouldn’t be here Starlighter.” The even lilt of her native language did nothing to hide that her response was terse, strained. Kam was caught a little off guard, but he hid it behind cheek. “What? Surely it’s dim enough in here to sneak by. You seem to be trying it.” Kam adjusted his stance so that he could keep the other patrons of the cantina in his peripheral while directly watching the actress Tuja Kyrenic turned suspect. The actress in hiding showed no appreciation for his cheek given the circumstances. Her response was disdainful. “We consider you a subject expert on being dim. However, we disagree that it is dim enough to conceal an SIS snoop, especially one making stupid jokes.” She unlike some Arcona still spoke in the Arconan first person plural even after years of contact with Basic. Accustomed to the quirk, the brash, self-assured agent brushed it off. Instead, he feigned offence at the slight. "Stupid? Me? Come on. I'm sure everyone has wanted to walk up to famed action actress Tuja Kyrenic and say that." He began to overdramatize his reaction, "I'm hurt... I'm wounded..." Then he broke character as quickly as he had entered it and dared to move closer. "I'm actually here to help." Kam's tone went from loveable goof to down to business quicker than than most could say, trouble. He leaned in slightly to complete his now conspiratorial stance. "Let's just leave it at I believe you. I don't have all the evidence, but I've got enough to know someone's not playing fair in the court of public opinion." Tuja sat expressionless, her large green eyes now fixed themselves on Kam. He had her undivided attention. "We cool a moment? Hear me out." he raised his open palms in a placating gesture. Movement caught his attention just on the almost ignorable edge of his vision. Since it wasn't nearby or heading in their direction, he ignored it and continued. "There's only so many coincidences before it gets deliberate. I've been keeping count, and you've been set up too many times. I don't know who you crossed, but it's getting bad. Fast..."
Tuja's patience faltered. "We are aware of our situation. We don't need you to tell us that." The look she gave kam confirmed to him that he had precious little time to recover before she became the dangerous thing he had to worry about. He put words between them as fast as his mouth would cooperate. "That's not what I'm talking about. There's stuff out there... in the dark dank, corners of the holonet that are much worse than the stuff making general news." Again something caught his attention in the peripheral, but it just seemed to be people moving out of the way, closer this time though not in their direction. He continued trying to convince her to take him seriously, "This isn't that nut that stalked you for a week. This is serious Tuja. Someone's making it real easy for everyone to find you dead, missing, or worse and not ask too many question... That's beyond a bad situation." Kam stopped. This time the movement in the corner of his eye was moving distinctly towards them. 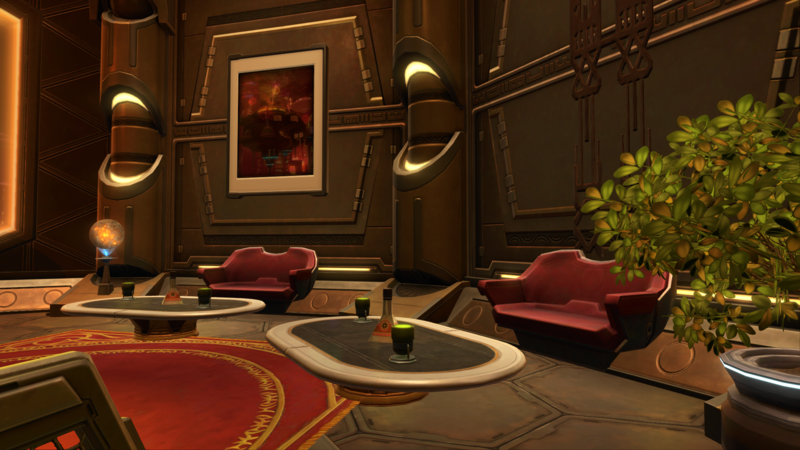 Since Tuja and he were in an out of the way area of the cantina, there was no way this just a random passerby. Kam turned to face whatever was heading in their direction. Three figures made a straight line for the counter where Kam had found Tuja. In front was a scalely, orange Trandoshan. The reptilian species had contibuted more than its share of mercenaries and bounty hunters. This walking ammunition locker one was likely one of the two. To the left of the Trandoshan was a scarred, teal Twi'lek man. This one was clearly no dancer and the jagged pits scarring his face and lekku meant he was clearly not one to be triffled with. He was armed with a heavy blaster as if he expected to see way worse than what a cantina had to offer. Even more, he carried various blaster recharge packs on his belt ready to reload should things drag out. The last member of the trio towered over the other two. The tip of her top knot ponytail scarcely came low enough to graze the top of the others' heads. The Cathar's muscles looked as though she punched dursteel just to watch it squeal and her scowl surely would have done the trick had a punch failed. Of the three, she looked like the one that you would like to cross least. They stood before Kam but focused on Tuja. They had come for her. The trandoshan spoke for the group. He looked unwaveringly at Tuja but spoke to Kam. The hissing, emphasized "zzzz" of his native tongue cut through every other noise in the cantina. "Leave. We have business with this one." He pointed a taloned finger at Tuja. Switching into "worst case scenario mode", Kam thought fast and spoke faster. "Hey, hey... I'm sure if you leave your comm frequencies, Ms Kyrenic can make sure you each get a signed poster for your bedrooms. No need to crowd." Kam attempted to put himself betweek Tuja and her assailants, but he was fresh out of ideas for dealing with heavily armed combatants in close quarters. The Twi'lek gave Kam a disgusted look before he spat out his ultimatum. "Leave or be smeared on the walls. This has nothing to do with you Human. Go slum with aliens elsewhere." Kam prepared to retort when Tuja cut him off. "Starlighter... Kam... no." The cornered agent rolled his eyes at the ill timed capitulation and started up again. "Tuja, yes. While I'm sure your fan club would love to have a piece of you. Some of us trying to keep you in one piece." The argument continued, "Kam, no... Stay out of this. This is bigger tha-"
Kam cut her off and ask impatiently, "I'm trying to save you here, do you mind?" "Enough stalling!" the cathar in the back of the group snarled. Tuja's final words cut through the din. They were eerily calm. "Fine... Remember, this is what you asked for. Kam looked striken as concern rose and burned like fresh steam. Quickly, he spun around to face the Arcona. His shoulders dropped as did his expression. He watched helplessly as they all definitely sailed pased the point of no return. The freighter exited Hyperspace returning the mesmerizing streaks of stars and light particles to the stationary twinkle of normal space. Risha maneuvered the ship near the planet. The freighter sat just outside of Themaya's sovereign space. 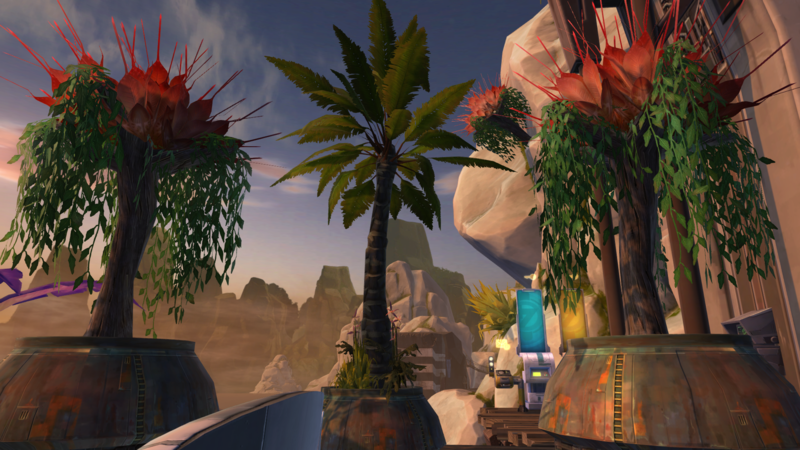 In the distance, the shaded, rocky world could be seen through the ship's viewport. Wispy clouds wound around the planet like ancient cobwebs as it's backlit moons circled on their nightly orbits. Risha looked out over the night shaded world with barely tempered eagerness. Risha: There it is, Themaya. There's a lot going on down there. We'll have to be careful.The government here calls itself the Upper Echelon. I've arranged a meeting with the leader who calls himself The Empowered One. Ancient titles aside, that's not where the real power is. Then why are we talking to him? The Captain leaned against the wall and folded their arms. There was skepticism in their voice. Smuggler: No offense Risha, but why exactly are we talking to The Empowered One if he has no power? Risha: Because like most "important" people, the Economic Committee uses their underlings to deal with the rabble. It's just bureaucracy. You don't have to like it. You just have to go through it. Risha gave the Smuggler an apologetic shrug. So how do we get to the ones in power? Smuggler: Ok, so how do we get around this guy and talk to whoever's in charge? Risha: We don't. I'm afraid there are no backdoors, and all of the open areas good for landing appear to be heavily guarded. We can't exactly sneak in either. The Captain's question trailed off waiting for Risha to fill the missing blank. Risha: To get approval to land and operate on the planet through accepted channels. Not to mention getting access to the Economic Committee. The Smuggler rested their head in their hand. 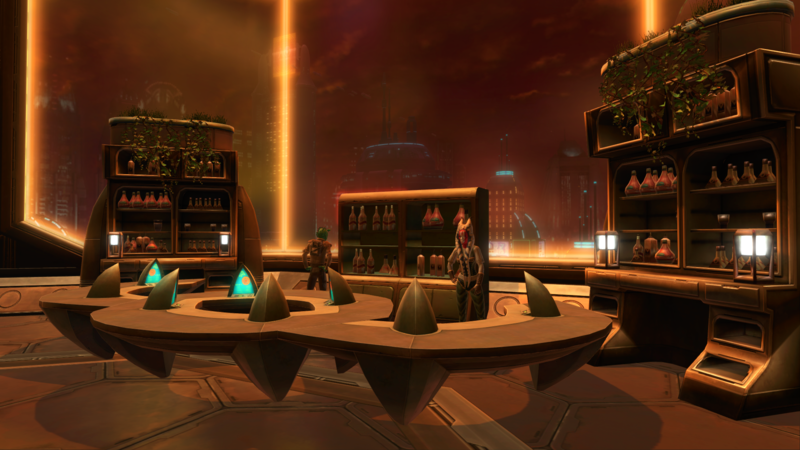 Smuggler: Since when did we operate through proper channels? This is going to be worse than Coruscant. Risha's answer came swiftly on the heels of the question. Risha: Since we ran out of alternatives, that's when. 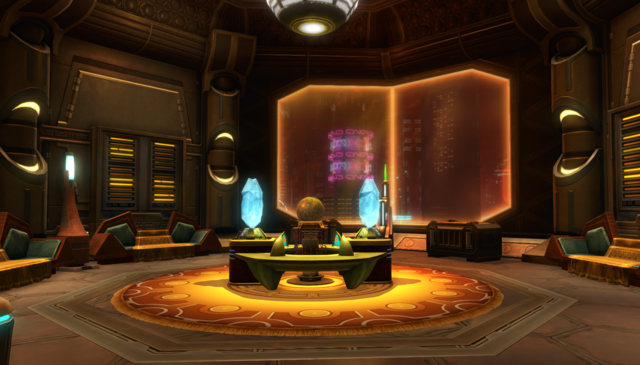 Nar Shaddaa might be a better analogy, though. Hopefully there will be less double crossing. You are wasting my time, Risha. Smuggler: I don't have time to speak to powerless nobodies, Risha. The Captain was aggravated to the point of raising their voice. Risha: I know, but this is the only way. Like most "important" people, the Economic Committee leaves their underlings to deal with the people they don't want to talk with. And yes, I took the liberty of checking for ways to get around them all, but there are no backdoors. Not to mention all of the good landing areas are heavily guarded. We can't exactly sneak in. Can't we just clean up the mess and then talk to them later? 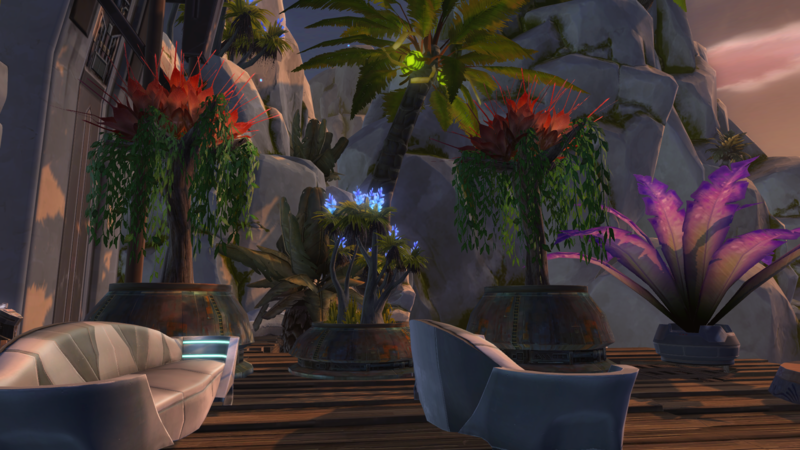 Smuggler: Couldn't we just land anyway, clean up the imperials, and demand they pay us? Risha did not look impressed with that idea. Risha: No, and there's no guarantee that they would pay us even if we did. I checked for ways to get around all of, but there are no backdoors. Even Worse, all of the good landing areas are heavily guarded. We can't sneak in either. If you want to get paid twice or three times, we'll have to play it their way. Welcome the first mission in the Smuggler Class Story for my world, Themaya. Here's how you move through it. Read through a thread until you come to a choice. Choices are hidden in spoiler tags so you only see the path you chose as you play through it. Follow the "Continue the Story -->" links to progress through the story. Look for the option that fits where you are in this story and what you accomplished in game. As you go through the story, imagine it as if you were playing through a mission in game. If all my best plans go well, some choices will lead to different outcomes, will affect how companions and other NPCs feel about you, and may lead to helpful or not so helpful surprises down the line. To that end, look out for highlighted bits of information such as *Risha is Offended*. Highlighting will help you to pick out some of the more significant events and items. In the case of highlighted reactions from companions and other NPCs, these are actions that they will remember and may act on later. Due to limits on time and energy, you'll notice that your character is mostly referred to as they. I'm afraid I just don't have it in me to do full duplicates for male and female chacters. I will use her and him when necessary though. In game, some options and situations only applied to male or female smugglers, so references or follow ups on those will match accordingly. To jump around or revisit missions, head back to the main Themaya thread to start a mission from the beginning. Also, feel free to leave feedback on threads through votes on the posts you like, PM, or leave a post in the main thread. May the Force be with us both on this journey. The SITH EMPEROR has disappeared into parts unknown after draining all life from the Imperial world Ziost. Republic and Sith Empire alike anxiously await his next appearance. The SMUGGLER has returned to building their underworld empire and taking the odd privateering job. However, things between the Smuggler and the Republic are not as lucrative as they once had been. See it in true Star Wars crawl form here on Youtube. Please excuse the typo. It took hours just to get it working this much. Warning the Star Wars music may be loud. 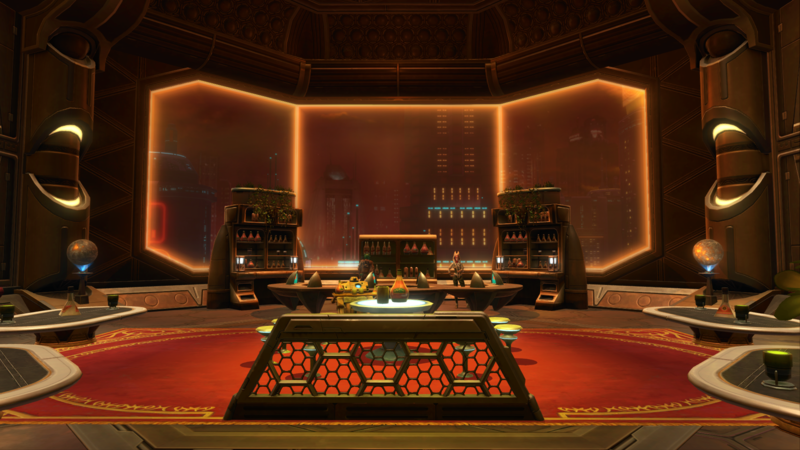 The lounge of the freighter had the lived in look of a room that had seen victories, defeats, and and a few parties for absolutely no reason whatsoever. The crew scattered around a table in the corner where a battle of wills of and skill played out. The captain leaned back in smug nonchalance waiting for the next hand to finally be played. Smuggler: You know Guss, you could just throw in the towel now and save yourself some trouble. The Mon Calamari's brow furrowed in deep concentration as he turn strategies and outcomes around in his head. Guss: Oh no you don't. You're not going to rattle me. I finally got you right where I want you. The smuggler smirked at the padawan turned smuggler and gave an indulgent shrug. Akaavi leaned dispassionately against the wall as Corso perched near the table grinning like a monkey Lizard. Corso: Come on Guss, you know the captain could probably fleece a Hutt faster than gundark on wheels. Better give up before you end up with extra refresher duty. Risha sat in a nearby chair watching the game only as a concession to her boredom. Risha: This would only be the 7th game of Sabaac you've lost today, Guss. What's one more? Risha sarcasm was half-hearted as she still had nothing better to do. She leaned her head against her hand when Bowdaar growled from his stool nearby. Mention of the incorporeal menace lurking unfound in the stars sent involuntary reactions around the room. Facing a monster that had sucked all life from a planet, when last seen, unnerved even the hardened among them. Smuggler: No offense Bowdaar, but I think I can put off finding the Sith Emperor for one more day. But I get your point. Things have been slow around here. Ever since that truce on Yavin the republic hasn't had as many jobs for us. Our arrangement with the Republic isn't exactly paying out right now. Risha: We've gotten more excuses than credits as of late. That's no good when you're trying to create the greatest underworld Empire since Nok Drayen's. Risha gave the smuggler a knowing smirk. Smuggler: I guess finding his treasure wasn't enough huh? Risha: No that was just a start. Nok kept his people in line by showing them who's boss and who brings in the the money. We need a score, a big one. Something that will get people talking. Fortunately, for you I know just the thing if you'll go for it. Risha: Nok kept his people in line by showing them who's boss and who brings in the the money. We need a score, a big one. Something that will get people talking. Fortunately, for you I know just the thing if you'll go for it. I'm attempting to write a class story and planetary arc for a planet of my design as an exercise in quest writing. There is going to be a lot of trial and error and possibly at lot of revisions in this project, but you'll never know what you can pull off until you try it. So far I have rough outlines for the class story and some of the side missions. Eventually I will better define some outlines for the planetary arc. I'll write for the smuggler story first as I have the best idea of where I will go with the story for that class. As I complete missions, I will turn them into forum threads, to approximate making them playable, and link them here. 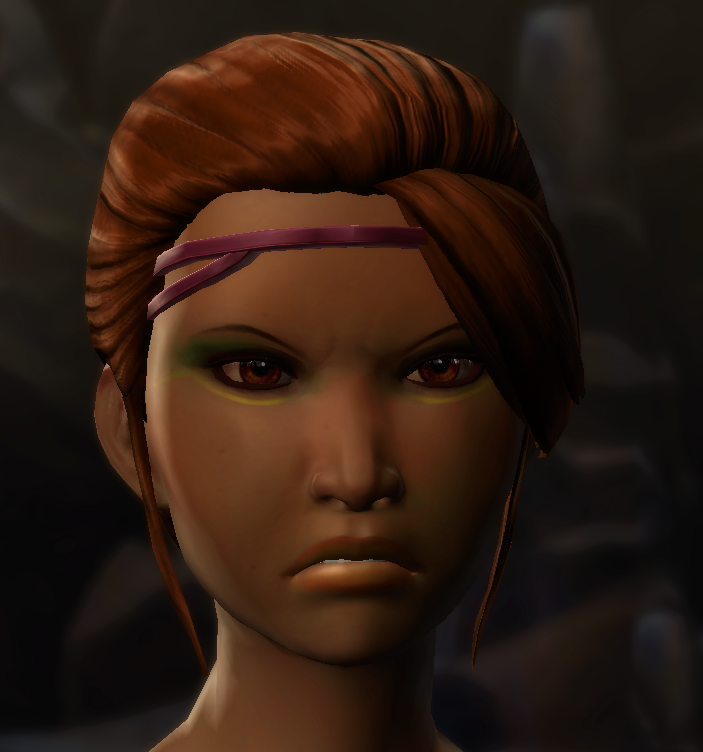 I am pleased to say that I have finally captured Jessak's Angry Gizka face. It took like 5 restarts of that mission to catch it too. Nevertheless, this is the point of reference for when she makes that face in RP. I'm looking for these to add to my available decos not to resell and I'm willing to work out some payment for these if anyone even has one. Alright then everybody, it's almost that time again. If you have lingering stories you want to work on, even if it is just a few hundred word short story, give it another shot this November. I will be doing it again this year and hopefully I won't get sick halfway through this time. It's time to get writting everybody. Since I proposed a big thread of main forum threads that could use some other people looking at it, here it is. If you have threads over there that you'd like to draw attention to, whether you started them or not, just drop them in this thread. Also, if I have a broken or misdirected link in this post let me know. Can the game accommodate three color and tertiary armor dyes? Droids and Cyborgs and Dyes OH MY! 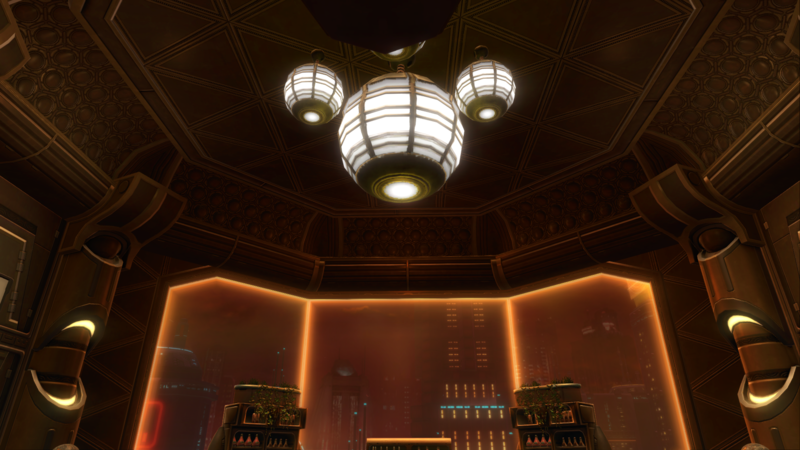 I created a thread on the SWTOR forum for requesting changes to the hooks decorations go on. Feel free to add to it if you can and maybe those changes will be slipped in here and there through the coming months. Given that the devs are in listening mode, I think now would be a great time to give them a heads up about game directions that blindside the RP community, so that can avoid it in the future. My main forum privileges shouldn't run out until the 27th when they do there maintenance, so I think I have time to get out a thread if I can nail down some issues. So what do you think was disruptive to RP about the last two expansions? It split the community. It put area barriers between the haves and have nots, so to speak. The 5 year time skip forced a splintering of group stories and loss of general cohesion because some weren't ready to rush that far ahead so fast and some wanted to stay apace of the story. People didn't have enough time to tie loose ends. The story was so much about the Outlander that it was hard to tell where a character that was not the Outlander fit in.